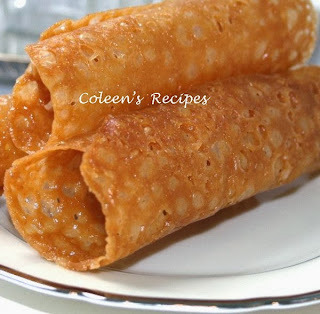 If you want to impress your holiday guests, make some of these Brandy Snaps for them. They look so elegant and they are definitely not something you see on every holiday table. A hard candy shell filled with sweetened whipped cream...do I have your attention yet? Pretty fool proof if you follow my extra tips below printed in RED, AND you can make them days in advance and fill them just before your guests arrive. Brandy Snaps are basically a crisp, sweet, lacy, candy shell that you can fill with sweetened whipped cream or your favorite mousse. They look very hard to make, but it is an illusion; they are pretty easy if you pay attention to the tips below in RED. Since this whole process goes VERY fast, it is best to have everything ready before you start cooking the above ingredients. Preheat your oven to 350° and line a cookie sheet with parchment paper (important). These candy shells REALLY spread as they cook, so only plan on making six of them on each cookie sheet. Mix the sugar, corn syrup and butter in a small saucepan. STIR over medium heat until the mixture is good and bubbling, then remove from heat and stir in the flour and flavoring. Drop one measuring teaspoon (per candy shell) of the cooked mixture onto the parchment paper. This will spread out into a circle about 4" in diameter as it bakes for about 6 to 7 minutes, but watch them very carefully after six minutes, as they can go from caramel colored to DARK very fast. It sounds tricky, but it isnt. My candy circles were fairly pale in color until they hit the 6 minute mark in my electric oven, but they were a beautiful light caramel color at 6 1/2 minutes. When they have turned a nice light caramel color, remove from the oven and let them sit on the cookie sheet for about 30 seconds. If they look a little oily, LIGHTLY dab them with a paper towel. Use a pointed knife and lift the edge of the candy circle up a little so that you can grab it with your fingers (be careful, this is VERY hot). One at a time, quickly roll the candy circle around the handle of a wooden spoon (they will cool almost immediately and hold their shape). Once you form it around the spoon handle, it will instantly be cool enough to slide the candy tube off of the handle, and its done!! If the other candies get too "hard" to roll, put them back in the oven for 30 seconds or so (but that shouldnt be a problem, as they stay fairly pliable as long as they are on the hot cookie sheet), they only become rigid once they cool off. I didnt use a spoon handle, I used some metal cannoli tubes I have and they worked perfectly (no need to grease the spoon handle). Keep the cooled candy tubes in an air tight container until you are ready to serve them. 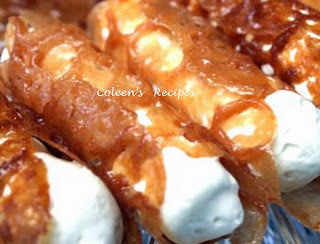 Fill them with sweetened whipped cream (the candy tubes can be filled up to about an hour before serving). Dont be scared off by any of my "warnings about this recipe, it may sound complicated, but it really is pretty easy and I hope you try it. NOTE: I substituted rum extract for the vanilla, the candy tasted like butterscotch. I think ANY extract would work. NOTE: You dont have to fill these with whipped cream. Almost any mousse like whipped filling would work wonderfully.